Graphs At A Glance: The cost of putting £1 into an employee's pocket in the UK is the fourth lowest of the 28 EU nations. Only Malta, Ireland and Cyprus are lower. Why have the wages of the 90% stagnated in Britain in recent decades? Is it because employment taxes make it too expensive for employers to pay us better? An interesting graph from the "New Direction" foundation (founded by former prime-minister Baroness Thatcher) sheds some light. The graph from a 2014 report shows the cost to an employer of putting £1 into an employee's pocket - after income tax and National Insurance (employee's and employer's contributions) have been paid - is close to the lowest in Europe. Only Malta, Ireland and Cyprus are lower. Perhaps the problem is we are already paid too much? Eurostat provides figures on this, showing that of the five largest EU nations, the UK's labour cost is at the bottom together with Spain. So what is the reason 90% of Britons did not share in the "good years" before the Banking Crash? Answer the poll - you can select up to two answers. If you can think of another reason enter it in 'Other' (If it is a good one we will add it to the multiple choice). 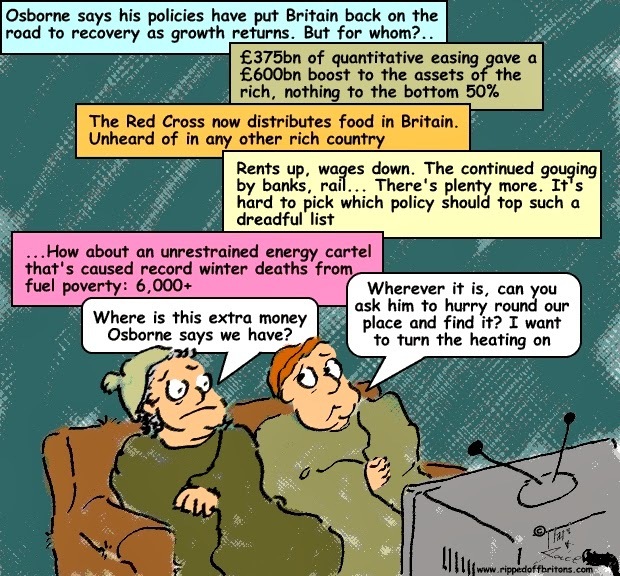 Why have wages of 90% of Britons stagnated in real terms? Because of the exponential application of technology, we have now passed peak employment for all job sectors except for those at the very top, ie: top executives/ officials in such fields as government, science, universities, nonprofit, healthcare, culture, and the media. Wages of the many are being transferred to the capital of the few at an alarming rate. The old anti-Luddite arguments no longer apply We have entered a completely different situation, for which we need to find new solutions, and fast! We should consider a national social wage. Higher, progressive taxes for those who benefit most from our nation's resources and infrastructure, ie: better off individuals and businesses, are an urgent necessity. Agreed re diagnosis; not sure about the proposed solution. Bring back the Bradbury £. Unconditional Basic Income - All citizens are paid an income e.g. £1000 per month. The personal circumstances make no difference to the payment! So unemployed, sick, super rich, fireman, doctor, student, all still get the payment until they die. Funded by the now obsolete welfare cash, closed loopholes so NO tax avoidance or evasion and a Robin Hood Tax. Economy is kick started as the only people who spend are those at the bottom. Shareholders, rewards for directors and fear are the main reasons. At the moment, it's an employers' market. Workers know that many companies use zero hours' contracts, or require their employees to register as self-employed. They're not likely to leave a seemingly stable job for one they're at all uncertain about and so if they're not going to leave, employers are less likely to feel they need to increase wages. Since the recession, shareholders feel that they can't guarantee long-term financial gain from their shares. So they want as much as possible in the short term and shares are more valuable where profits are greater and profits are greater when overheads are lower. Finally, Directors etc are rewarded by boards and head-hunted by other companies if they are seen to do a good job. One part of their job is to make sure profits rise and one way of doing that, as discussed already, is to keep wages low. These days, staff are not rewarded for their work, merely compensated for the time (in some cases, only some of the time) they spend working. Skills and experience are worth nothing anymore, unless the skills and experience are in directly controlling the money in and money out in a way that benefits the shareholders.